How to buy Kindle in Singapore? Most of the Kindle you see in Singapore is actually the U.S. version, though some are from U.K. or Japan. Due to the strong Singapore currency against U.S. dollar, it is worth and easy to buy your Kindle at Amazon U.S..
[Update: Amazon has announced the launch of All New Kindle Paperwhite in early August 2013, brief highlights of the New Kindle Paperwhite features can be found here]. Click here to see the latest Kindle deals in Amazon U.S. Okay, I will make this How to buy Kindle in Singapore tutorial slightly detailed and specially just focus on how to buy Kindle in Singapore, this will allow you to have a better view on the whole process. 2. How to deliver the Kindle to you? 1. You need a Credit Card or a Debit Card. 2. Register a package forwarder account. 3. Register a U.S. Amazon account. (You may consider to signup Amazon Prime Free Trial to take advantage of 2-Day Express Shipping, click here to learn more about Amazon Prime). Step 1: Register a FREE account with the package forwarder. Since Borderlinx has stopped their operation, you can use other services such as ezBuy or vPost. The process is very similar. Based on my experience with many other package forwarders, so far this offer a very competitive rates with excellent services and they use DHL which I find the reliability is very important when sending things from overseas. If you do not have any account with them, you can sign-up now, you don't have to pay for anything until you need their service one day. – Visit their official website and sign-up a free account with them, the sign-up process is very simple and self-explanatory. Step 2: Your package forwarder account settings. – Input your home delivery address and contact number if requested. – Input your payment details (credit card details, etc.). Step 3: Select your Kindle models. Click here to select the Kindle e-ink range. Click here to select the Kindle Fire range. – Select the quantity then click the “Add to cart” button at the right. – A pop-up windows may appear to promote some Kindle accessories. – Click “Proceed to checkout”. Proceed to Step 4. There are some accessories e.g. Kindle screen protector and Kindle casing listed at the bottom, you can “Add to Cart” if you want to purchase. 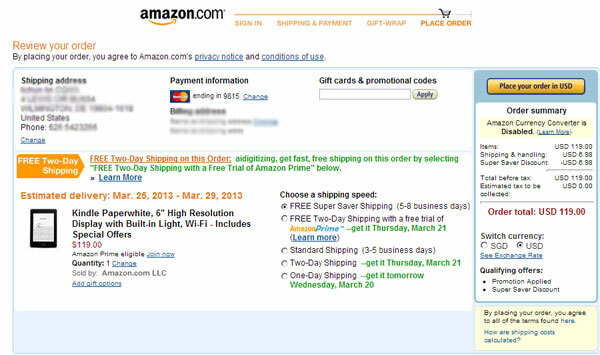 After proceed to checkout, you will be prompt to sign in the Amazon account. – Input your valid email address. – Click the radio button “I am new customer”. – Click “Sign in using our secure server”. – Input your name, email address and password. – Click “Create account”. Proceed to Step 5. Step 5: Set “Virtual Address” in Amazon. At this page, you will be asked to enter a new shipping address. – Input the “Virtual Address” including Phone Number accordingly. – Leave the “Optional Delivery Preferences” alone. – You can choose the billing address to be same as the shipping address, or your actual credit card address. – Click “Continue”. Proceed to Step 6. It advisable to copy and paste the address from your package forwarder account. If the system prompt you to change the address to a suggested format, just click “Ship to this address”. Step 6: Choose shipping options. Choose a shipping speed. I usually choose “FREE Super Saver Shipping” which takes 5-8 business days. There is a shipping fee incur for other shipping options. – Click “Continue”. Proceed to Step 7. If there is no “out of stock” situation, usually it will ship out on the same day or next day. Not recommend to try the AmazonPrime at this point of time as there is a membership fee incur, you can explore about this when you are more familiar with Amazon in the future. Step 7: Choose payment options. – Input your credit card details. – Click “Add your card”. – Click “Continue”. Proceed to Step 8. It is advisable not to disclose your credit card details to other people. Step 8: Choose Billing Address. – Enter the address printed on your credit card statement and you need to input the “Phone Number” too. – Click “Continue”. Proceed to Step 9. I have tried both addresses on separate purchase transactions, use the “Virtual Address” as billing address will simply save your time to re-type another address. Step 9: Order summary of your Kindle. This is the summary page of your order. – Review the price, shipping charge and the total amount. – You can choose the display currencies, I usually choose USD. – REMEMBER TO CLICK “Place your order” button to confirm the transaction. As long as you do not click “Place your order” button, the transaction is not confirm. Step 10: Your Amazon Order. After your order has been placed. You will be given an order number, and the Amazon will send a confirmation email to your inbox. – You can always login to your Amazon account to check the status of your order. – Go to “Your Account” at the right top menu, then click on “Your Orders”. – “Delivery Estimate” is the estimated date that your package arrive at U.S. “Virtual Address”. 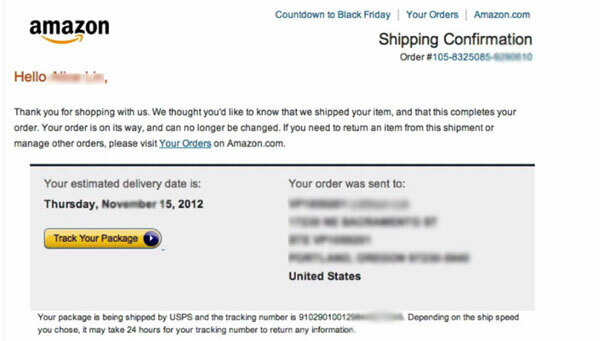 – Normally, Amazon will send you an email notification when your package has been shipped out. Step 11: Your package arrive at U.S. “Virtual Address”. Sending the Kindle to Singapore is very simple and straightforward as the Kindle is nicely packed in its own box and no repacking is required. – You will receive an email notification when your package arrived at the package forwarder warehouse. – Make sure your destination address in Singapore is correct. – Select your preferred shipping speed and insurance (optional). – Proceed to make payment for your package and instruct the package forwarder to send you the package. – The shipping charge for a Kindle is quite standard which is usually cost around S$20 or less. If the package forwarder run any promotion, it will be even cheaper. – The price differences usually caused by the insurance charge (which is optional) and fuel charge (which is vary monthly, usually S$1 or S$2 difference). – If you are buying for more than ONE unit, just making sure that your total cost (inclusive of shipping charge) is not exceeding S$400 per shipment to Singapore. – Anything exceeding S$400 will incur import tax(GST). In this situation, you can split your packages into several shipments (do this only if your import tax is higher than the sum of all your shipping costs). Step 12: Receive your Kindle and enjoy! This is how you buy Kindle in Singapore, the whole process from placing an order to receiving the package normally take about 2 to 3 weeks, subject to the shipping methods(speed) you have selected. After receive your Kindle, do remember to connect to wifi and register using your Amazon account. Don't forget to check out the post on how you can buy kindle book from amazon.com. Alright, that's the end of the whole process and I really hope this Comprehensive Tutorial on How to Buy Kindle in Singapore will help to save you time and money in getting your Kindle. If you find this tutorial useful, you're most welcome to share How to Buy Kindle in Singapore Tutorial to your family and friends, you can share your experience at the comment area too. 1. Don't forget to bookmark this page for future reference. 2. Share this on Facebook. 1. will it work if i got a friend who lives in US to buy the kindle and carry it in? Can i then log into my existing amazon account to start using my kindle? 2. It read like you suggest that buying the kindle should have a separate amazon account, and preferably one that uses a gift card so that no credit card info is given. Is that correct? 3. SHould my daughter get an account then? 4. All kindle books are purchased ONLY from Amazon is that right hence the need for an account? 2. yes, that is a better way. 3. depends on how old your daughter is, but its up to you to decide. 4. unless you don’t want to buy kindle ebook then you don’t need Amaozn account, you can connect kindle to computer and drag and drop ebook that you bought or download from other places into the kindle (it supports many ebook formats). about the echo, if you have android phone, download and install Amazon app, from there you install the Alexa app, then the Alexa app will guide you on how to setup the echo. Basically the process is connecting the echo to your phone via wifi (this is a special signal between Alexa app and echo, not your home wifi), then the Alexa app will begins to communicate with your echo for setting up your home wifi and location, time zone, etc. Hi! I had just purchased a kindle from amazon and I am using my friend’s package forwarder, so would they be sending the email notification when the package arrived at the warehouse to my amazon account email or my friend’s? Thanks ahead and looking forward to your reply! I had read the comments, so amazon would actually send me an email notification when the package arrived at the warehouse but the package forwarder would be contacting my friend instead right? Since it is under his account. Amazon email would inform you the package has been shipped out. Package forwarder email would inform your friend the package has arrived at the warehouse. I would like to check how long does it take to send my order from USA to singapore. As I just ordered my Kindle on the 8 April. And the tracking status says that my order has been delivered. So I am not sure this delivered is to my US address or Singapore address? In addition, how can I know that I need to pay the delivery charge, will they call me or I have to keep checking my tracking status? Did you use package forwarder? It should be arrived at the package forwarder first, and you will receive email from package forwarder that your package is arrived at their warehouse, you will proceed with payment and provide your Singapore address. The whole process usually take 1 to 3 weeks depending on the delivery service (speed) you have selected. try eBay, the easiest way, else Mustafa Center should have. Hi, I would like to purchase the kindle fire hdx 8.9 but jt costs more than SGD400. What would you suggest me to do? What’s the percentage for the import duty? The import duty will be 7% of your total cost (same as GST). Approximately how much in SGD to purchase a kindle paperwhite Wifi through Comgateway and Amazon? Want to compare and check is it cheaper to purchase from Singapore vendors. We have not use Comgateway for a very long time, we prefer Borderlinx, an unit of Kindle Paperwhite cost about SGD170-SGD180 including shipping cost right to your doorstep via DHL. 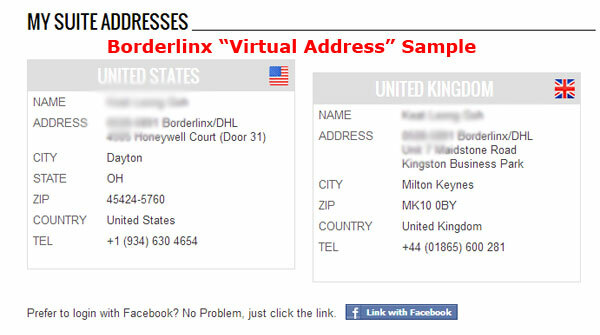 The address I used provided by Borderlinx does not work. Hi, I’m trying to order a kindle paperwhite but it says that it can’t be shipped to my address in sg. I have thoroughly checked that my billing address is correct. please help! Hi Clare, follow the steps in our above post carefully, Amazon doesn’t ship Kindle to Singapore directly. You need to signup the package forwarder account (e.g. Borderlinx), then you have the Kindle ship from Amazon to you assigned package forwarder address in US, the the package forwarder will then deliver the Kindle from US to your Singapore address. Hope that help, and please support us with a Facebook like. Thanks. I have my Kindle arrived at BorderLinx. Why does BorderLinx charge me an estimated shipping value of USD135, mentioning that there is no invoice in the package? What should I do? Please advise. You can contact the customer service and send them a copy of your invoice (screenshot or in pdf file), them will amend the amount for you. Hi! If I were to put the Virtual address as my billing address, the bill would simply be shipped together with my kindle, is that right? Thankyou so much! The delivery address is the important one, you can put any billing address, virtual address is ok.
My Kindle is faulty and I would like to return it. If I am shipping from Singapore, would Amazon reimburse the shipping fee? If they provide a refund to us for product, will it be at the current retail price? I bought the Kindle 7th gen during the Black Friday Sale for usd 49… its usd 79 now. So even if refund, won’t be worth it? You need to contact the Amazon customer service, usually they will guide you through for checking the device, if it is surely faulty, you just tell them you’re now at oversea, they will issue you a return label, print out and send the device back to them (speed post will do the job), remember to ask for reimbursement, and usually they will reimburse back to you. Try to ask for refund and buy a new one, you can check with them the amount they will refund back to you, if it is $49, then you may consider to ask them for a replacement and delivery it to the package forwarder instead. hi, i want to know the amount i have to pay to get it shipped to SG once my kindle has arrived in the US warehouse. bcos i am a afraid i have to pay a huge sum to get it shipped here. 1 unit of kindle usually cost around $25, if you buy 2 units or more, then you will save on the average shipping cost per unit. Just remember the total cost inclusive of shipping cost must not exceed $400 to avoid import duty. Add, and if I click is a gift. Do you think my friend will be able to check that it’s kindle? Coz I know there is this function whereby you click as a gift, they will block the description of the product. You can provide the tracking number to your friend. Hi, can I check if the warranty and protection stated in Amazon add on is also valid in sg? I was overwhelmed by the different types of kindle. But it seems that paper white is highly recommend by majority and I like the part where you can still read it even under the sun glare. Can I also check is it possible to download ebooks without the wifi function? And is it necessary to buy the adapter? Hi Ber, Kindle is not officially supported in Singapore, but you still can get the warranty when something happen, you just need to contact Amazon and tell them your kindle got problem and you are currently in Singapore, usually it is advisable to send the device to them and ask for refund, then you buy a new one. Amazon will reimburse you the shipping cost from Singapore to USA. And yes, the Kindle paperwhite is the most popular model, unless you have enough budget to spare for Kindle Voyage which is lighter in weight and sharper display. You can load the book onto your kindle just like drag and drop a file to a thumbdrive. Adapter is useful if you don’t want to use pc to charge your kindle. Hi, thanks a lot to your sharing which is very enlightening me. I am totally new to Amazon.com, hope you may advise me what to do step by step after buying Kindle from Malaysia website instead of Amazon.com. I have registered with Borderlinx, shall I use the virtual address to open account with Amazon.com.? Thks. Yes, you can create an Amazon account with virtual address, if you’re planning to buy Kindle book from Amazon, you can read this post for more information. If you’re using it to read your own ebook, just connect the Kindle to your PC and drag and drop the ebook into the Kindle (make sure the file format is supported by Kindle). Do like our Facebook page to show support. Thanks! Hi, I have a vpost account… Would it be better to use vpost or Borderlinx? It’s individual preference, though we always use Borderlinx. I already have an Amazon account and made some purchases before. Do I need to create another account? Or can I still use my account? You can use the same account as long as you’re using the risk-free method to buy book. However, using a separate account is safer in the sense that there will not be any non-US information in the account’s record. Do support us by sharing our website to your Facebook, thanks! If I was to set up a separate account in Amazon for my kindle purchases, can I still use my local Singapore credit card for payment? Ideally, you should not use local Singapore credit card on the Amazon account that you created for Kindle, but you can use it on your other Amazon accounts. I have been considering on getting a kindle as a gift and would like to ask if there is a difference in purchasing from Amazon U.S. and purchasing from 3rd party vendors. It’s a personal preference, perhaps you may compare them on the cost and warranty. I changed my country to US, and I downloaded via kindle on wifi. Using Singapore Credit Card. I just came across your article. What will happen to the downloaded books and my Amazon account? Probably one day you will receive a notification from Amazon requesting you to send them some document to proof your residency in US. Further ignorance may cause suspension of your Amazon account, thus you no longer can access your content in the account, but whatever already downloaded in your device will not be affected. 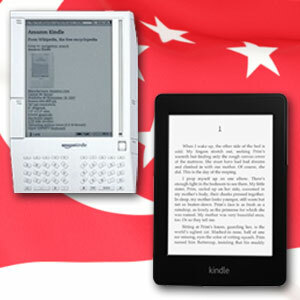 Do we pay for the kindle with the Singapore credit card or do we have to use the Concierge in Borderlinx to pay. 1. Use Singapore credit card to buy Amazon gift card for yourself, click here. 2. Load the gift card to your account. 3. Delete the credit card information from your account. 4. Buy the Kindle and pay with your gift card. Just wanted to ask why you are not recommending Singpost? I have used them several times and thought they were OK although they seem to have become more expensive recently. Are Borderlinx/comGateway really better? Am thinking of buying the Paperwhite but just trying to sort out shipping before i order it. Buying thing from oversea involves shipping time and your cost (usually high value items), we will not commend too much on vPost, they are ok when thing goes smoothly, we tried few forwarders in the past and we only recommend those that we are satisfied with. In fact, we prefer Borderlinx than others, they are more flexible and responsive, sometimes this save us from paying unnecessary charges. However, if you have some sort of discount code from vPost (at least 20% and above), then it is still worth to take advantage on them for the cheaper shipping cost. Tax will be imposed for total value of SGD400 and above. Your total delivery cost probably around SGD30 (depends on the service you select), add it to your Kindle price is still less than SGD400. You just need to pay for the delivery cost when the item arrived at Borderlinx US, and next you will wait for the delivery guy to knock on your door to pass you the Kindle few days or week later. Please refer to our tutorial on buy Kindle Books. 1) I’m travelling to my HQ in Japan for business trip, I am wondering if it is more worth it to buy Kindle Paperwhite in Japan as it seems to be the cheapest when I compared the price. Any advice on this? 2) If we are physically located in Singapore, can we still purchase e-books from Amazon US? I have a amazon US account. Usually I use comgateway for my purchases for other amazon items. Is it possible to pay the purchase of US e-books using Singapore credit card? 3) What is the difference buying kindle from US / Japan? Eg. power adapter / setup instructions? 2. 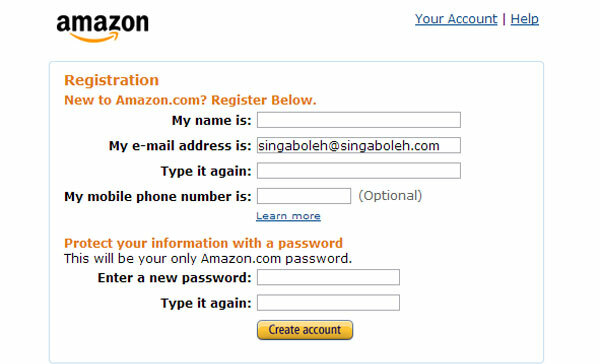 Follow our tutorial here on how to buy Kindle book in Singapore, do not pay with Singapore credit card. 3. Japan version has bigger storage capacity of 4G. Kindle is charged by micro USB cable, so no worry of that. I live in Singapore and I’d like to buy Kindle as a gift to someone who also lives in Singapore. I have an existing Amazon account. 2. Order the kindle using my existing Amazon account, pay with my Singapore credit card, enter the US virtual address as the shipping address. 3. Get a Kindle gift card for the recipient. 4. When the Kindle arrives, have the recipient register the Kindle, and set the country setting to US. Please let me know if the Kindle registration must be done using the device itself, or can this be done via the Amazon website??? 5. When purchasing books, recipient should connect to a VPN (to get a US IP address) and purchase the book with the gift card. 2. Yes. Before checkout your shopping cart, remember to send the Kindle as a gift so that it will arrive unregistered. 3. Yes, recipient must register a Amazon account and claim the gift card to the Account. 4. Turn on the Kindle, connect to wifi, sign in with recipient Amazon account, the Kindle is now registered to recipient Amazon account. The rest can be done via Amazon website later. 5. Yes. Anything not clear just refer back to our website or drop us a message. Thanks for visiting, don’t forget to “Like” us and share to your friends. I just bought kindle paper white 6″. Coming to Singapore from US, leaving in36 hours. Staying near city hall MTR. Where is best place in SIN to buy a cover or screen protector near there? Hi Steve, Amazon Kindle is not officially available in Singapore, not many retailers will keep stocks for its accessories. You may try Mustafa Center at Little India. Hi Sharan, congratulation! Please refer to this tutorial for more info. Hi I read that our account may be suspended if we purchase ebooks directly using the Kindle we purchase from Amazon, is that true? Yes, if you are not using a US credit card. May i just check with you, Amazon is currently offering the kindle paperwhite at USD 119 for those with “special offers”. Meaning adverts will appear at the bottom while reading, I just wanted to ask if it will be applicable in SG? like if i ship the device from amazon to use it here in Sg, will i have a situation with the adverts? Hi Melissa, the adverts will not appear while reading, check out this post for details. If you don’t like the adverts, you can pay the diff to disable it in the future. Hi, how much would the cost be to ship in from the proxy? I used Borderlinx’s cost calculator and it came up to be over 2k. Is the cost really that high? Hi Ethan, make sure you select the correct display currency. If you are referring to shipping a Kindle to Singapore, it usually cost around $25, or around $20 when there is a promotion tie-up with certain credit cards. Hello I am thinking of getting a kindle paperwhite however all my books are in pdf form on my laptop. Will I be able to transfer these on to the kindle? Kindle support pdf format too. Just drag and drop your books onto the Kindle device. Hi Singaboleh, thanks for the very comprehensive guide i just placed my order today and lets see how it goes! Cheers! Hi. Sorry last question…I hope. 🙂 How can I use the 10% off shipping in comgateway? During check out, there was no offer to enter promo code but they gave me one in their welcome pack email. No problem Chari, have not use their promo ever since they revamp their website, so can’t really advise you on this. Do login to your account, look for “Services + Support” and click on the “contact us” then “chat” to ask their customer service for latest info. Please check that your billing address and payment method are from a supported country.. I used the virtual US address from comgateway but I’m still stuck. What should I do? Thank you so much for the help. Try to use the method in this post, but instead of buying book, you search for app. Do take note that not every app in the app store support Kindle fire. Hi bro, I have just recently bought the latest Kindle Paperwhite but having trouble connecting to Internet. During the wifi setup, after keying in my network password, it says Connection Failed. It can connect to my wifi but could not reach the Internet. I have tried it with my smartphone hotspot, also same issue. Any solution to this? Or is my a faulty device? Appreciate your help man. Thanks! – make sure the airplan mode is off. – try to use password less than 8 characters for your wifi. – reboot your device by pressing the power button for 20 second. If problem remains, contact Amazon via email or live chat. If confirmed it is a faulty device, you need to ship back the faulty one and they will reimburse the shipping fee. Lastly, if you find the return process is too troublesome, as long as the other functions of the device has no problem, you can live without wifi, some users are actually turn off the wifi all the time. Anyway, the warranty last for 1 year, you can always consider an exchange at a later date. No problem at all, we welcome your questions. The shipping charge for a Kindle usually usually cost around $20. You need to enter yout credit card number and go through the phone security pin varification during the payment process. The package forwarder ship other things as well, but do read our post on FREE SHIPPING TO SINGAPORE, some of the products can be sent directly from Amazon to Singapore free of charge, however these products exclude Kindle and its accessories. how much is the shipping fee from their warehouse to singapore?? and will they be able to see my card number? Hi, I ordered kindle fire hdx 8.9 in amazon with a much needed help from your blog. However, the cost for the tab plus the accessories exceed SGD 400. The total amount is 700 sgd. Any idea how much shipping tax will I incur? I hope it wouldn’t be that much. Thanks. The import tax is 7% INCLUSIVE of the shipping cost charged by package forwarder. You may try to contact the package forwarder if they allow you split your item into several shipments (do this only if the tax incurred is higher than the total shipping costs). Support us by Google+ or Share our blog in Facebook. Thanks! Hi again. The latest update from Amazon regarding the shipment of the kindle was that it was delivered and the package was left on dock; delivery reciept signed by GEI. That was around 6 hours ago and yet no update from comgateway. The current orders still show nil orders. Should I be worried? Thank you for the help. Hi Chari, worry not, it is sales season, give them 1 or 2 days to process and update to your account. Oh ok. Thank u so much. Just to clarify, I will receive an email when my package is delivered to the warehouse and then they will ask for my singapore address? Or do I need to fill it in beforehand? If yes where? Guide me through in more details thank you!! Yes, you will receive a notification email once your item reached the warehouse and ready for despatch to Singapore. All you need is to login to package forwarder account to select the delivery option and pay. You can enter your Singapore address before hand. It is best to sign up an account with your preferred package forwarder and login to your account for better understanding, the interface is quite simple, each package forwarder has it’s own guide, the process is more or less the same. Worry not, once you hands on you will understand. Thanks for the speedy reply! I’d just like to ask where exactly to fill up my singapore address. Having a hard time finding it haha. Depends on which forwarder you are using, usually under ‘my account’,’your account’ or ‘my address book’. Do support our website by Google plus or ‘Like’ us in Facebook. Thanks! We have been using their service for many years without problems. They do tie-up with some banks credit card to offer discount, e.g. DBS. 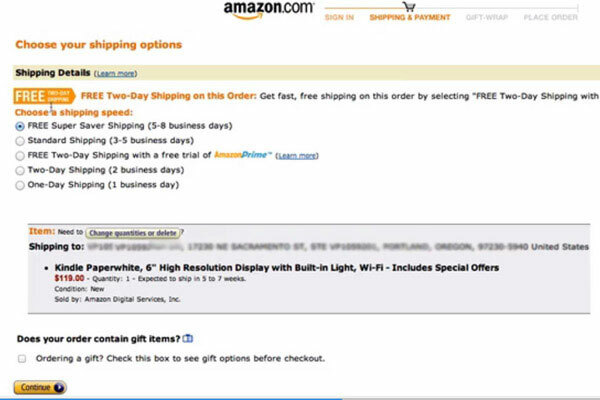 May I know wat is difference beteween “special offers” and “without special offers” option in Amazon? Also can u recommend me a kindle model- basically i need it to read and mayb can surf some other apps amd mayb emailing? Also do i need internet connection when i reading the books? No internet connection is needed for reading books. Kindle Paperwhite allow you to read in the dark, its e-ink technology is great for reading book (just like reading on paper) but not so smooth in surfing net or emailing. Kindle Fire is more suitable for internet surfing and doing multimedia stuffs but not as great as Kindle Paperwhite in reading book. It is recommended to read with Kindle Paperwhite and use a smartphone for emailing. Please refer to our tutorial on how to buy kindle book, not advisable to buy or even download any book thru bookstore on your device, your account might be at risk. If I buy a Kindle Fire with 4G LTE from Amazon, will I be able to use the device with local 4G in Singapore?? hi, thanks for the post – it’s very useful. one question though, would the warranty still be valid if I buy from Singapore? Need to send back to the US for repair? and return needs to via the virtual US address again? Warranty is still valid. You can open a case with Amazon through windows chat for troubleshooting. If it is confirmed a faulty device, you can get refund or exchange. Exchange process is troublesome, better ask for refund, you will need to send (via Singpost service will do) the device back to them, they will reimburse you the shipping cost and the refund amount after the faulty device reached them. After you got your money, buy a new one. Of course, this must be done within the warranty period. I have shipped a kindle to Malaysia using the above way, no problem. The only issue is i used Borderlinx, which they overcharged me on the tax and duty. Instead of charging the actual amount, they required you to pay in advance an estimated amount which is obviously higher than the actual. I have requested DHL for a K1 form to look at the actual amount and I am asking for a refund from them. But I doubt they will refund it. I also notice Borderlinx has an option to shipped using DHL express, which cost around USD10 extra. I tried that but to my surprise, DHL local agent told me that the package is actually only shipped “normally”, it is not an express package. I would not recommend anyone using Borderlinx. Hope you can update us the outcome of your tax refund. Thanks. I have just pre-ordered the new generation of kindle paperWhite to be released on Nov 5th. At the same time, i have also ordered an adaptor which is available right away. Both ordering are done via amazon itself via the prime free trial account with 2 days of free shipping to the virtual address, and with delivery address being the virtual address i registered with comGateway. Hence, I would get my adaptor delivered to the virtual address on Oct 14; but i can only get the new model of kindle delivered to the virtual address on Nov 7th. 1) After I placed order via amazon with the delivery address being the virtual address i registered with comGateway, do i need to manually add those amazon orders to my comGateway account? if not, how would comGateway recognize that those items delivered to the virtual address are my items rather than any delivery wrongly to that address? 2) As stated, I would have 2 items with shipping from amazon to the virtual address apart by around 3 weeks. Will the delivery from the virtual address to my singapore address be two delivery apart by 3 weeks? or would it be one time delivery with the 1st item waiting for the later item and after both items are ready, the one time delivery would be made for both items? Appreciate if someone could contact me personally for the clarification. 1. Every virtual address has its own identity , just make sure you fill in every single digit of your virtual address. You will be informed when your package arrived. 2. Contact Amazon immediately and state that you want the 2 items to be shipped together. If this is not possible, inform comgateway to consolidate your 2 separate packages into 1 shipment so that you can save your shipping cost. Comgateway can hold your item at the warehouse for 30 days free of charge. I just contacted amazon.com representative and she told me they do not offer contents to singapore…im confused. is this why you have to register your country as US and is it changeable? i need to read both Japanese and english. Do you know if i need to switch countries anytime i need to download books? Yes, Kindle and it’s contents is not offered to Singapore. Basically, the methods demonstrated in this website are ‘back door’ methods to bypass the restriction so that we can still enjoy using Kindle in Singapore. You can’t have it registered with Amazon USA and Amazon Japan at the same time, but you can de-register your Kindle from one Amazon account and re-register it with another Amazon account, and you can always switch between these two different accounts, so it is changeable in this way. The only concern is we are not to sure will Amazon restrict this in the future. hi, do you know if there are any differences between US kindle and Japan one? Basically they are the same. If you are referring to the All New Kindle Paperwhite, the Japan version has bigger storage 4G compare to US version 2G. Just one more question, I have an existing VPOST account, but I have not used it before. How’s your experience with VPOST? If you are vpost new user and want to enjoy the first-timer discount to ship kindle device ONLY, please go ahead. I personally tried their service for few times, but now I can only say that I will avoid using them at all cost. Maybe I will share my experience with them in the blog some day. Oh I see….ok I’ll consider my options carefully. Thank you!! I already have a registered account with Amazon, and they allow me to enter a new shipping address during checkout. Can I just key in the virtual address at this point? Must I register a totally new account with Amazon for the virtual address? Yes, you can have multiple address on your Amazon account. Thanks for the tutorial! I just bought (pre-ordered) the new Kindle Paperwhite. Anyway, I have a question. Do I need to contact Comgateway when Amazon sends me an email saying they have delivered to my ‘virtual address’? Or will they (Comgateway) automatically ship the product to Singapore after they have received it? Comgateway will notify you once the package is arrived. You need to login to Comgateway, choose the delivery speed and make payment. After payment made, they will deliver the package to you. Can i input my debit/credit card details when i’m using Malaysian card? Does Amazon accept payment from malaysian credit card? Yes as long as your card can perform online transaction. Must be visa or master. I got my Kindle and correct me if I am wrong, I need to register using US address. Am I right. Also I guess we need US IP address to logon for registration as otherwise cannot register as US user which has lot more advantages. If you have purchased the kindle through amazon, usually it has been pre-registered. However, you can refer to this post to set the country for your kindle http://www.singaboleh.com/buy-kindle-books-in-singapore-and-malaysia/. You don’t need to turn on the vpn during registration (but no harm to have it on if you like to) unless you’re making an ebook purchase.